Temperatures will reach near-tropical warmth this weekend in parts of the UK and Western Europe with highs ranging from 18-24 C (64-75 F) and Sunday feeling especially warm in the sunshine but it will literally be the calm before the storm. Category 2 Hurricane Ophelia is responsible for the warm air and as it pushes north-east it will also weaken before smashing into the UK and Ireland late Sunday evening. 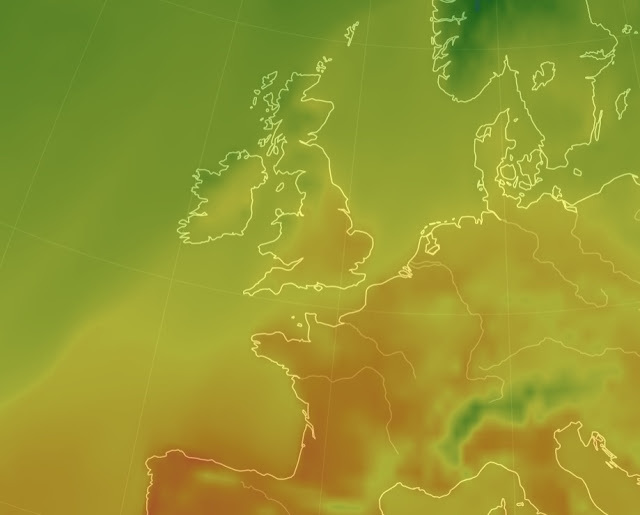 Earthwindmap showing warmth for the UK and Western Europe. The Met Office has released Yellow warnings as very strong winds are forecast to affect western parts of the UK during Monday. Southerly winds are most likely to gust between 55 and 65 mph across much of the warning area with the potential for gusts of 80 mph in coastal areas, particularly in Northern Ireland. These strong winds are forecast in association with the northward track of Hurricane Ophelia across or near to the west of the British Isles. Heavy rain is also possible in association with this system with the northwestern UK most prone at this stage. 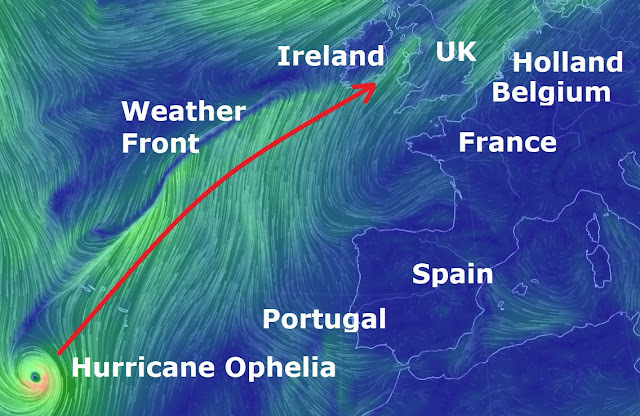 Despite losing its tropical characteristics, Ophelia will still be a powerful windstorm as it tracks near or over western Northern Ireland and western Scotland late Monday into Tuesday. Based on the projected path of Ophelia, wind gusts of 60-80 mph (96-129 km/h) may cause scattered power cuts and significant travel disruptions throughout Northern Ireland, western Scotland and western Wales. Some structures may sustain damage and flying debris could result in injury. "There is likely to be local wind gusts over 80 mph (129 km/h) across the high terrain of western Scotland and coastal regions of the Irish Sea and gusts to 100 mph (161 km/h) can’t be ruled out," said AccuWeather Meteorologist Tyler Roys. Travel by road, rail and air will be impacted along with the potential for disruption or closure of ferry services. "The strongest winds will impact Northern Ireland late Monday into Monday night," said Roys. "Scotland, Wales, Northern England and the Midlands will receive their strongest winds Monday night into Tuesday," added Roys.